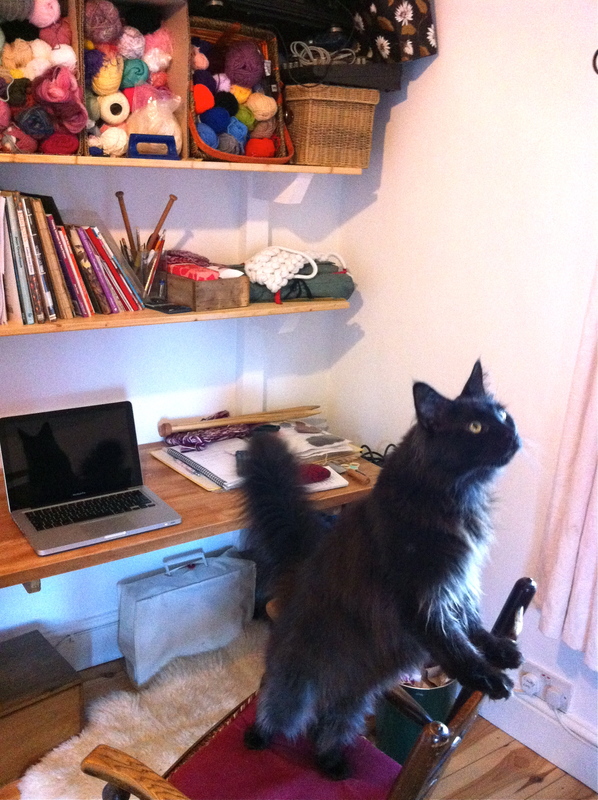 In preparation for the arrival of the Great Wheel, my studio workspace was due a revamp. 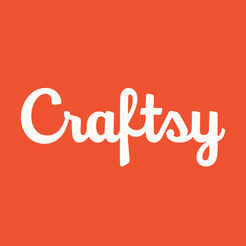 Time to get rid of the pile of cardboard boxes and containers where I stored my yarn collection. The OH redecorated the entire room and built 15 cubbyholes into the alcove. I just had the luxury of spending the entire week in my studio, having taken some long overdue leave from the FTJ (full time job). 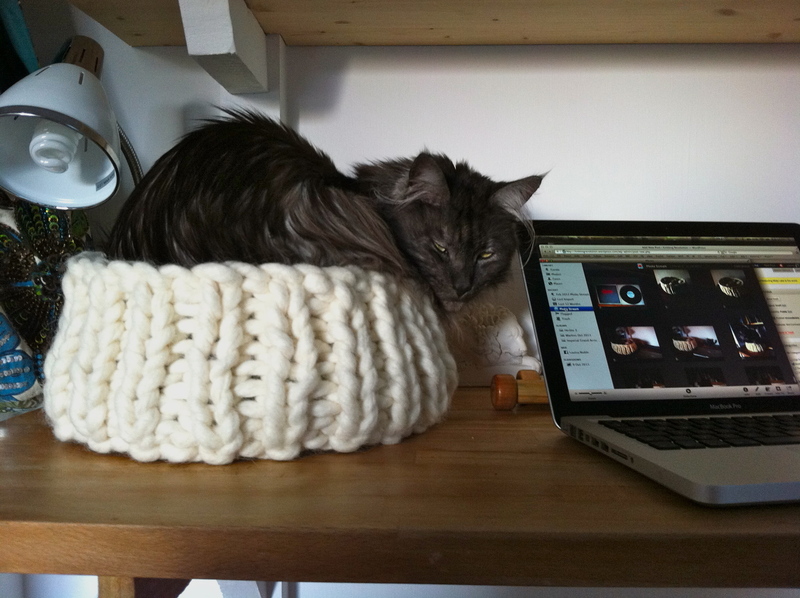 Allowing myself more or less all day to plan, create, and knit has been wonderful. You can see from the sheer amount of clutter on the desk that a few projects are in progress. A knitting pattern is ready to be posted, there are sample basket bases, a part-finished knitted handbag, some completed cotton cloths, double pins, needles, thread, and a pile of spiral coasters. 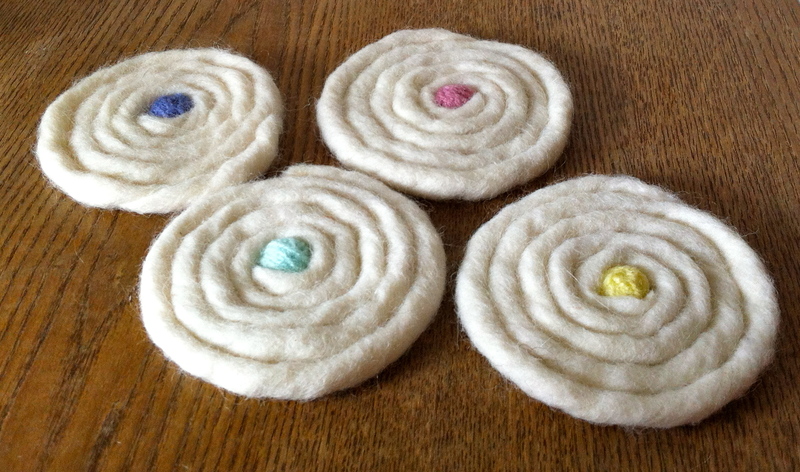 I am loving the spiral coasters, even though they are not knitted, just sewn in place. I decided to take some pictures of them, with Larry’s help. I think the cats have enjoyed having me around the house all day. 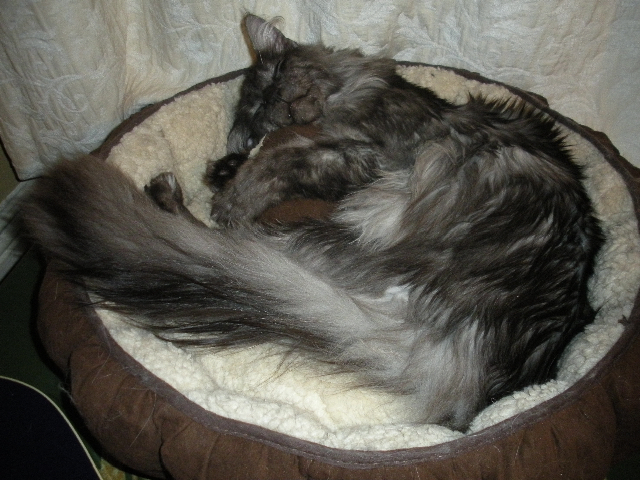 There is usually one or two hanging out with me, either on my lap or in one of the baskets. The FTJ next week is going to be insane, as I will have loads of catching up to do plus lots of preparation for a trade event next Friday. But I must try to harness this week’s creativity and motivation, and continue with it in every spare moment. I’ve got to design more patterns! It was going to be such a quick and easy project. Just working part of a pattern I had already written, using super-chunky yarn on oversized needles. I actually thought I could get it right in one or two goes. How naive was that, I see now, after losing count of the number of attempts I have made to get it perfect. The issue I have grappled with is getting the circular base to lie completely flat. The usual pattern of increases led to terrible puckering. Once I reached the sides and went vertical, it was relatively simple. But I didn’t know if the base would lie flat until I had finished the sides. To save time, adjustment after adjustment, I just worked 4 or 5 side rows and pulled the needles out so that I could check the lie of the base. I realised early on that I had to work fewer increases to avoid puckering. But the exact pattern of increases was a matter of trial and error. At the same time, I didn’t want to end up with too few stitches to knit the sides. Working out a happy balance between these two requirements was my problem. Finally I have written a pattern of increases that I am fairly happy with. 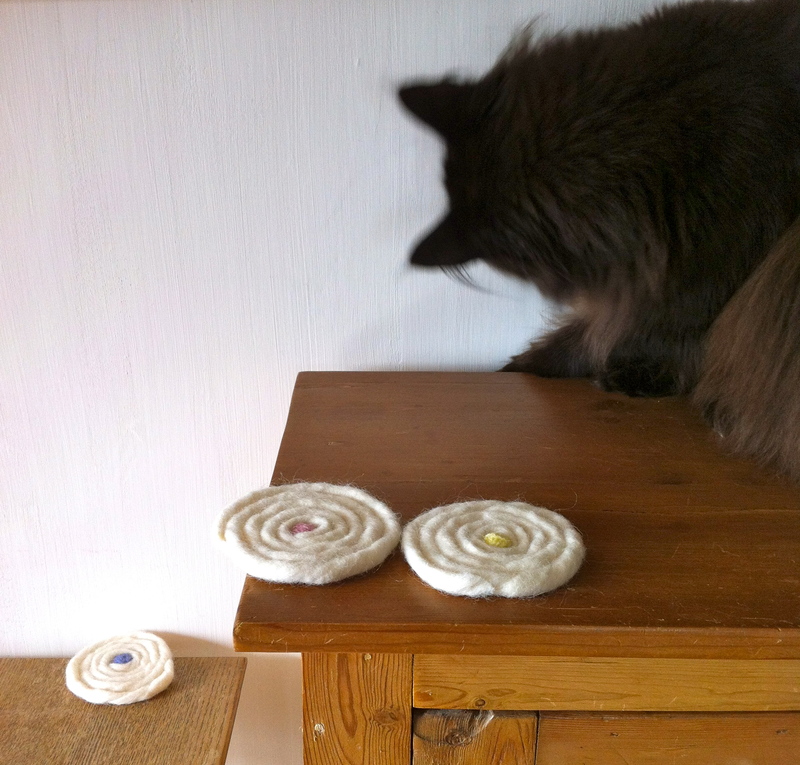 When I have finished yet another prototype, he comes to inspect it. …if only it were bigger! I’m working on it Monty, I promise. This is the largest size I can make with my existing tools. My next step is to get rid of the seam and go circular. But I need lots of enormous double pins for this which will take a while to find…. 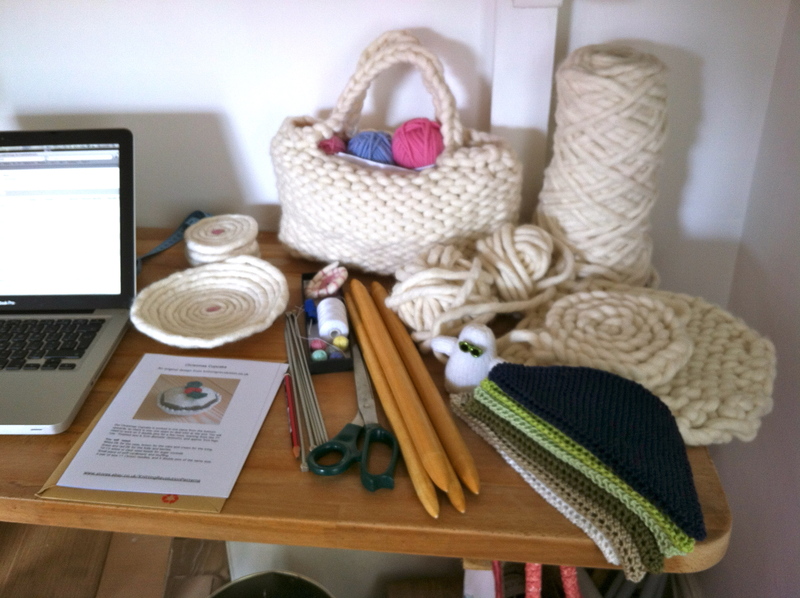 Extreme Knitting – a step closer! 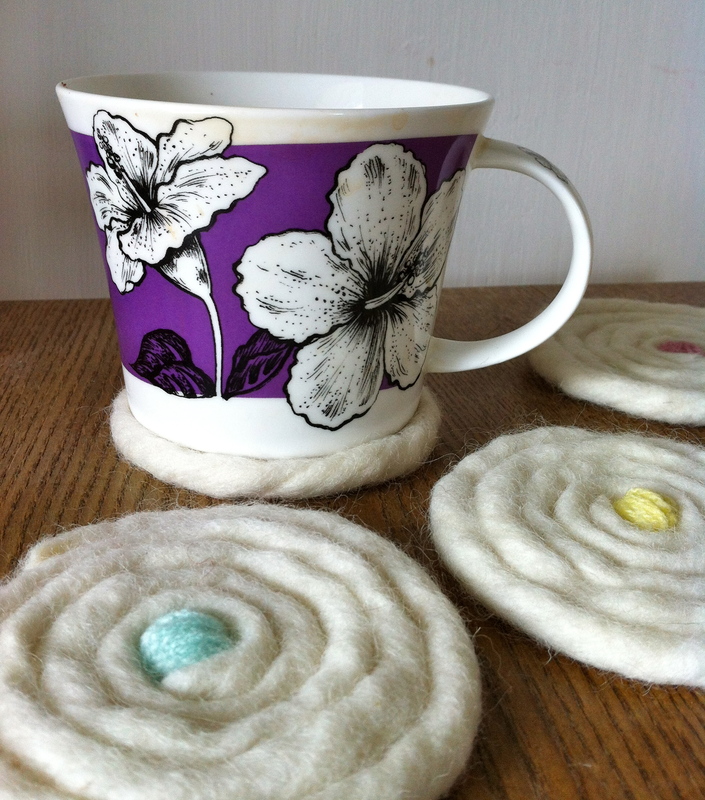 Last week I had a grand day out at the Knitting and Stitching show in Harrogate. 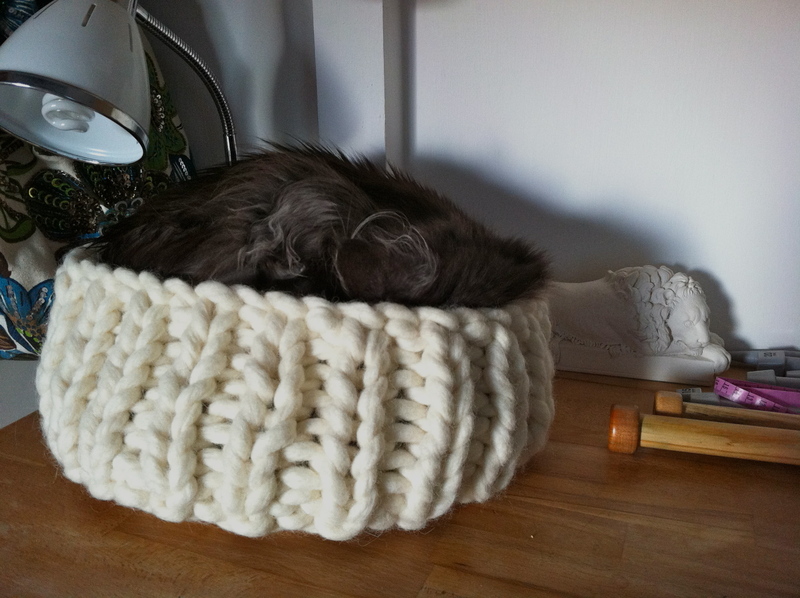 I finally found the super-chunky wool I had been looking for – and at a good price. …a basket, and this is my first attempt. It wasn’t as easy as I thought it would be: knitting on this large scale exposes every slight unevenness in your work so you end up really wrestling with the huge needles and concentrating hard on your tension. It became apparent that I would need more needles and I would also need to try different sizes to get my tension right. So, another work in progress. I came across a most useful stand at the show selling specialist lighting for crafters, and oh my goodness, I have been needing a decent light for doing close up work in my studio. I chose a retro model with a special bulb to grace my table top, and here it is, with my lion and knitted black cat checking it out. I managed not to break the bank with all the scrumptious yarns on offer, but I did fall in love with this little beauty….a silky soft, powder blue mohair…love love love it. What shall I make with it? 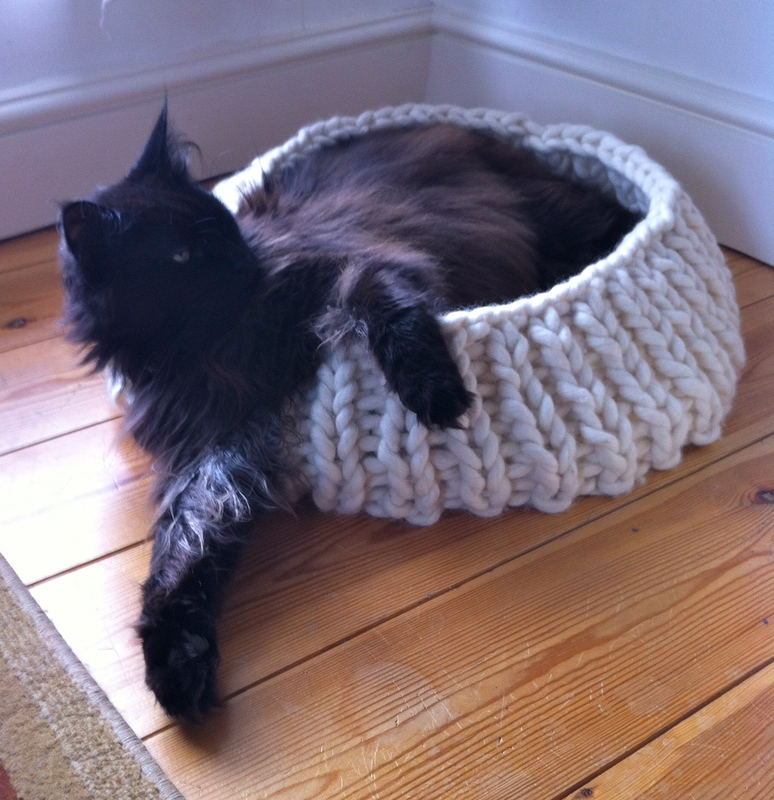 Finally, after attempt #7 at the knitted basket, Monty was very pleased with the result. It was just one of those unfortunate things. Laptop was open on the kitchen table, I was in the middle of working (erm, OK, surfing the tinternet). Other items on the table at that time were: half a cup of cold tea abandoned by an earlier visitor, and a pile of greetings cards which had been removed from the bookcase that afternoon in a bit of a tidying session, and some other paperwork. Can you guess what happened next? OH called me into the other room to ask me something about the thing he’s working on. My back was turned for less than 2 minutes. There was a loud noise. Back in the kitchen, the cards and the other stuff on the end of the table, were on the floor. The cup was not tipped over, but some tea was splashed across my keyboard, and Monty was leaving the scene. Disaster! 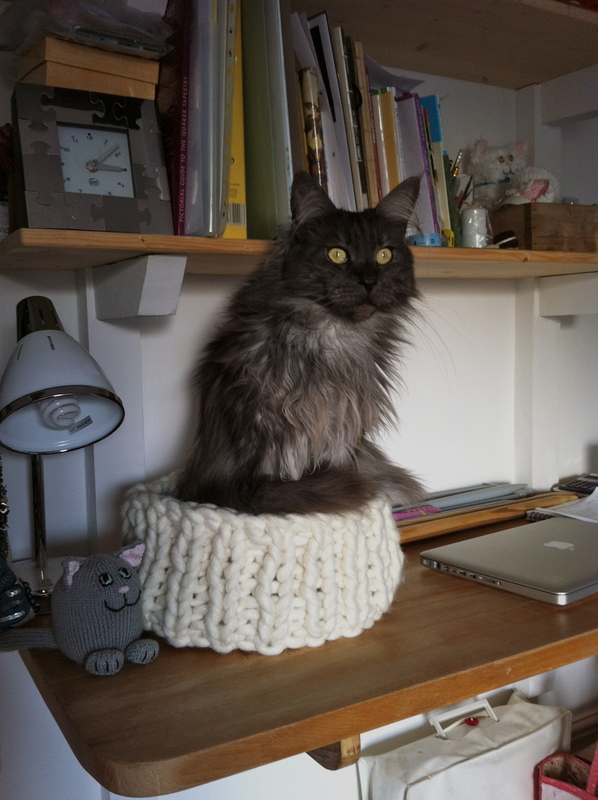 For some reason, Monty had leapt onto the kitchen table at speed, and must have landed on the slippery, glossy pile of birthday cards, skidded into the cup and sloshed cold tea across my laptop. 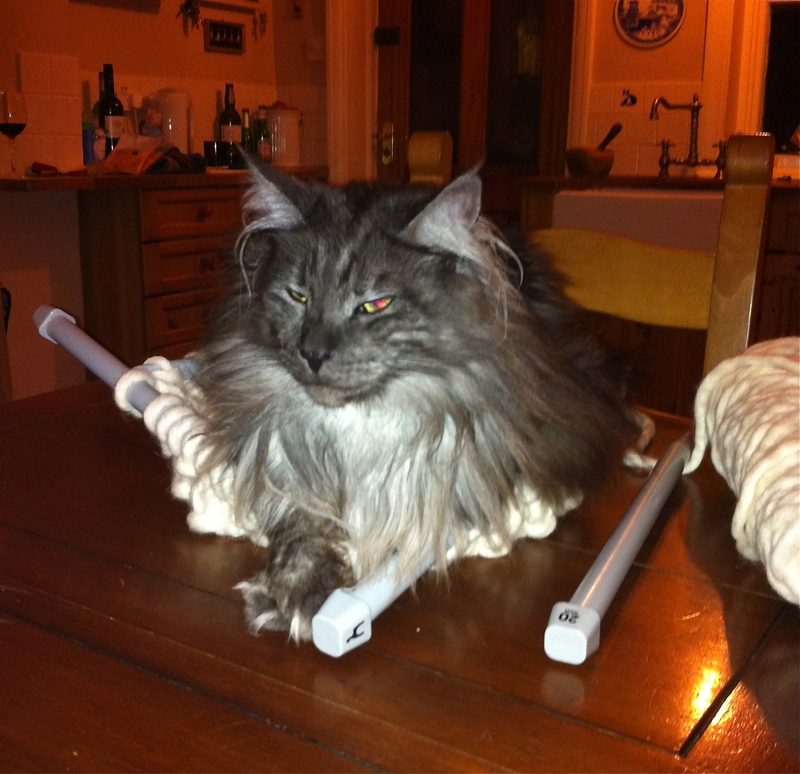 Still, cat owners will know that this episode is not Monty’s fault. It is our fault for a) not clearing away the old cup of tea immediately, and b) causing a slipping hazard by ‘tidying’ cards into a pile, and c) not closing the laptop the minute I left it. Anyway, it really wasn’t a lot of tea, I mean, the cup was still standing. I mopped it up and the laptop was still working. So I thought, well, no harm done. This laptop is pretty sturdy. After all, it has been knocked on the floor a few times by boisterous kittens and lives to tell the tale. But after a few minutes, the internal fans started whirring like mad, and then it all went black. Then I knew I was in trouble. If you look very carefully around Monty’s mouth, you will see some butter appearing not to melt. To be creative, you need the time, space and inspiration to express yourself in your chosen medium. If you are trying to create around a full time job and other commitments, that time and space are all the more precious. I am loving my new workroom! Due to a massive re-organisation of stuff upstairs, I now have a whole room for my creative space. 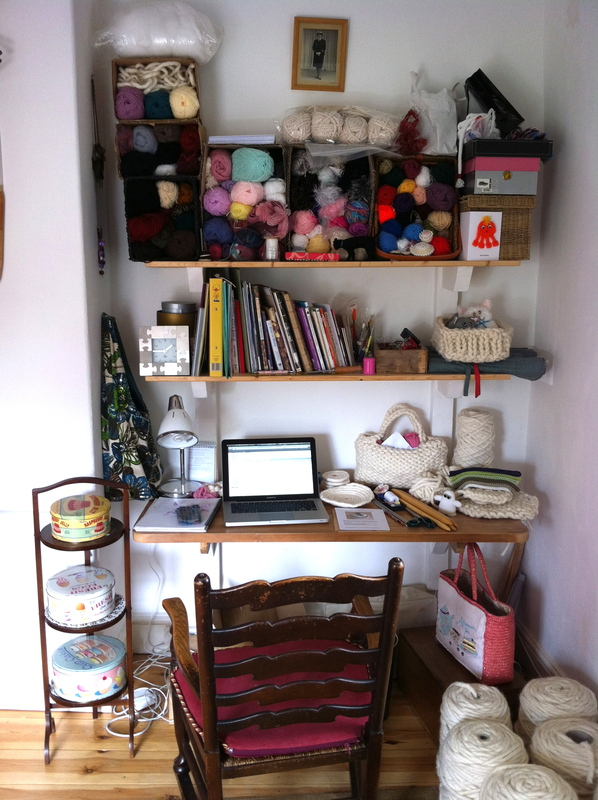 You don’t really need a lot of room to knit in, but it makes a difference when you are surrounded by the yarn and objects of your choice, rather than someone else’s gear relating to their project. This room was previously a music studio, but that has gradually been moved downstairs. A few bulky bits of gear were left, but after nearly 2 years of no use at all, we decided to clear it all out. OH built me a worktable using the leftover piece of beech kitchen worktop and beeswaxed the surface. 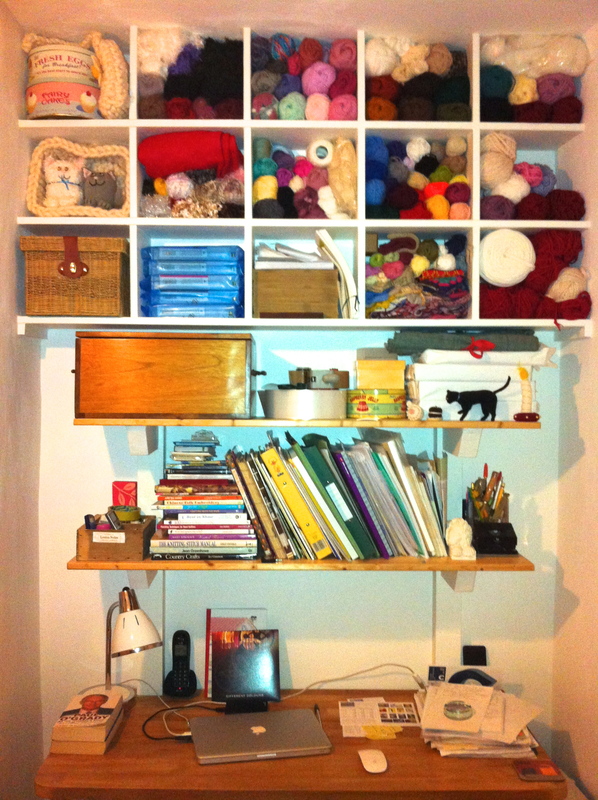 I re-organised my yarn stash and gathered all my knitting books and resources together on the shelves. It’s a fantastic hangout for me and the lads, when music stuff is happening downstairs. From my chair I can see every ball of yarn in the stash. Which tells me that I’m going to need more shelves. 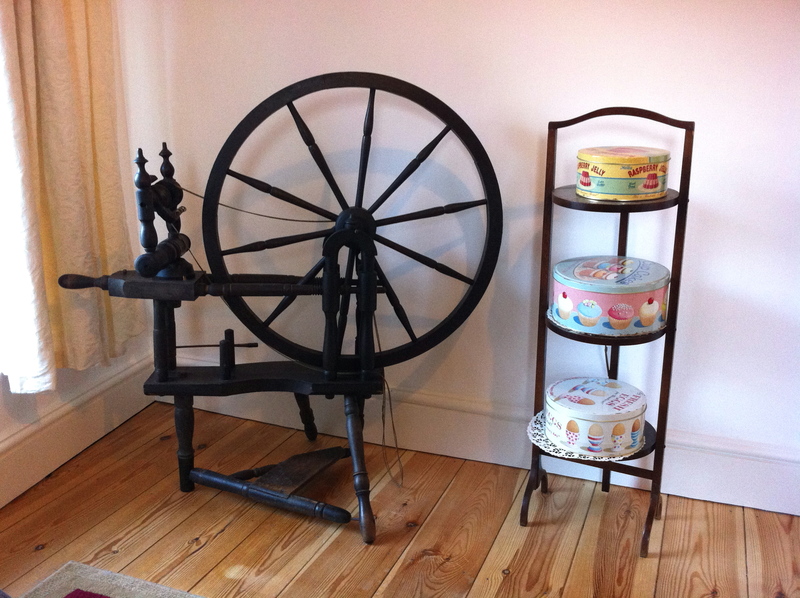 I also have space for my spinning wheel. I haven’t learned how to spin yet, and my wheel needs some attention, but for now it’s a beautiful and inspirational object and I love it. The stand next to it is a 1930’s cake stand. I can just imagine it loaded with cakes, and the waitress in a frilly apron…. 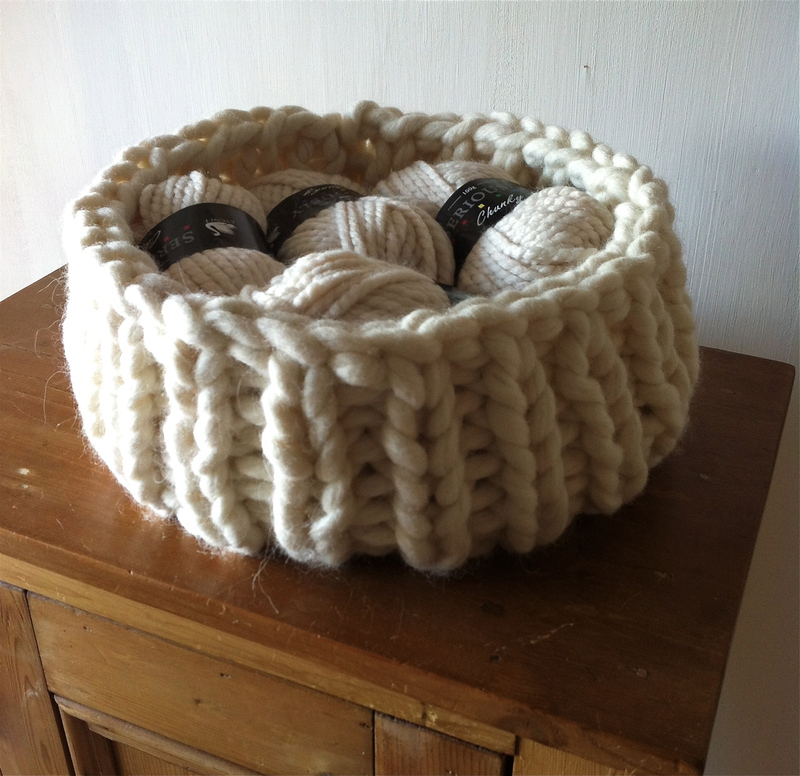 So where better to keep my knitted cake samples, in cake tins, on the cake stand. Having said that, I feel that I’ve ‘done’ cakes, and it’s time I moved on. I have a few ideas in the pipeline, but creative decisions take me a long time. Hopefully my new creative space will help me to get moving.